Now you can keep track of your schedule while you’re on the go. Sync directly to Google, iCal or Outlook, and automate bookings from your website or Facebook page. Versatile calendars. 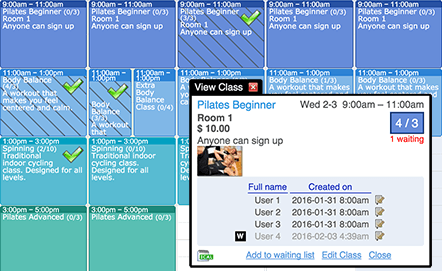 SuperSaaS is ideal for booking sporting events, one-on-one classes or group sessions for a wide range of health and fitness services. Custom pricing. You can offer different packages, work with a credit system, set pricing rules (e.g. “First lesson free” or “Buy 10, get 1 free”). Always available. Your customers can quickly view your daily, weekly or monthly calendar and book or re-schedule based on your real-time availability. Make it yours. You can add your own logo and style to your appointment schedule by configuring the layout, appearance and color scheme. Access control. Simple configuration steps show you how to customize the booking process and specify who can create, update or delete bookings. I tried four other companies before I found SuperSaaS. They were a lot more expensive and as much as they tried to make their software work for my needs, it was obvious that their product was designed for other uses. Not only did SuperSaaS eliminate any and all problems with our reservation system but also tripled the attendance in our Spinning classes. With the help of SuperSaaS, we were able to save hours of administration time, provide our athletes with 24-hour information regarding our hours of operation and gym availability, and optimize the use and efficiency of our training facility.